September was named after the month we got her and the reason we got her in the first place. She was supost to be my birthday gift when I was 7 years old, this was in September of 2001. The moment I laid eyes upon her I just knew. Picking her up then depositing her in my lap was much easier then, about 10 pounds easier, she fit like a glove and promptly went back to the nap that I had disturbed by lifting her furry behind. Ever since then she has forced her way into our hearts then kicked us off the bed, couch, and newspaper (she has an obsession with any paper product).I mean this quite literally, if Sepy is sprawled across our love seat you had better do one of two options; lose weight so you can sit in the space available or get comfy on the arm of the couch. Under no circumstances are you to move the cat. She's been there with us through everything and when things get hard she instinctively knows how to make it better. I've never met another person, or cat, who understands so much and gives so much love with such a god complex. What 's that you're holding? What a delightful picture! I agree totally with Claudia's comments about the picture but I especially find September's expression delightful. She looks so curious and so eager and so open to whatever she encounters -- you can almost see her adventure loving nature oozing out of her! My white cat Star is like September in that she gives up her spot to NOBODY -- if you want to sit or lie down where she is you can just find another spot, thank you: Starbaby moves for no one! Cute story and great picture. Thanks for sharing. September is so lovely. And you can tell from looking at this picture that she has quite the personality. By the way, this picture is amazing. 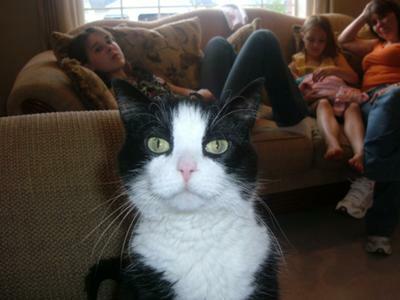 I love it that you see the cat in the forefront and her family in the background. And you can also see that September knows she's the center of attention. It's one of my favorite pictures. Thank you for sharing it with us. I'm sure September has been one of your best birthday gifts. I loved your story.